HCM CITY (VNS) — The high growth in retail sales and services and a taming of inflation in the first three months of the year indicate the HCM City economy's "robust" growth, People's Committee members heard at a meeting last Friday. 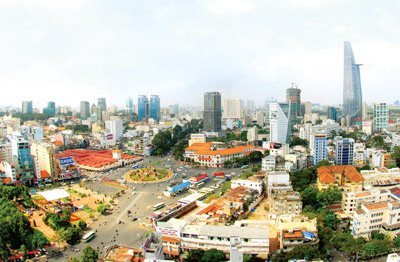 According to figures released at the meeting held to review the city's socio-economic performance, the city's economy grew by 8 per cent year-on-year to over VND202 trillion (nearly US$9.4 billion). The rate is higher than in the comparable period of the previous three years when it was well below 8 per cent. Retail sales and services topped VND159.37 trillion, an increase of 11.5 per cent. The real estate sector saw a turnover of over VND23.5 trillion, up 20 per cent. Thai Van Re, director of the Department of Planning and Investment, said the city focused on easing the difficulties faced by the corporate sector and creating a favourable environment for production and business by speeding up reform in taxation, customs, social insurance, land and house management, construction and company establishment and bankruptcy. Loans to enterprises in the five priority sectors of agriculture, rural development, small and medium-sized enterprises, supporting industries, and enterprises using technologies were worth VND137.6 trillion for a marginal rise. Loans to small and medium-sized firms accounted for 65 per cent of this. Industrial output grew by 5.6 per cent. Authorities said industrial production had been promoted with a focus on the processing and manufacturing sectors and a decrease in mining. Le Hoang Quan, Chairman the People's Committee, said the growth in the first quarter would pave the way for growth in the second quarter as well as the whole year. The city has taken measures to fulfill its targets for the year and mobilised resources to boost the economy by improving the investment environment and promoting production and business. It has also boosted its programme to restructure the economy, changing the model and improving the quality of growth by boosting nine kinds of services and four major industrial sectors that use high technology and offer value addition. The city plans to strengthen the programme to link banks with businesses, farmers and rural areas to encourage credit growth and create conditions for businesses to get access to funds. Conditions have been ushered in to support businesses for the time when Viet Nam signs the Trans-Pacific Trade Agreement and joins the ASEAN Economic Community. Quan urged the Departments of Transport and Natural Resources and Environment to speed up work on major infrastructure and find ways to improve the infrastructure to save fuel and transport costs involved in goods transport and boost economic development.